Ask anybody who has ever stood up on a wave and they’ll tell you there’s nothing like that first time. It’s an incredible feeling you never forget, one that can change your life. The same is true of skateboarding and snowboarding. Mastering these admittedly challenging skills is so exhilarating, not only because of the pure joy we experience when performing them, but the self-confidence we gain as a result. Such moments lead us to believe that if we can accomplish these feats, then there’s likely much more we can achieve from having the courage to try. Mikey Bondoc understands this concept. A talented surfer, skater, designer, writer and illustrator, he also understands that self-confidence doesn’t come naturally for everyone, especially kids. While all of us are born with unlimited potential and a desire to believe our dreams can come true, those feelings can easily fall by the wayside if not purposefully encouraged and pursued. So Mikey’s using his own unique gifts – some he only recently discovered- to help others understand this concept. 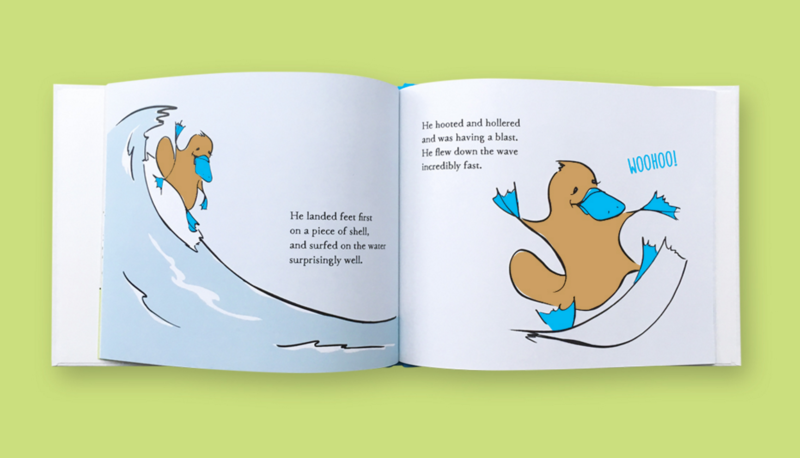 He’s created a children’s book series centered around a singularly unique, memorable, character: a blue-billed, web-footed platypus who loves to surf, skate and snowboard. The Hatch: The Radventures of Radimus Platypus is the first of Bondoc’s seven book series. He has written all seven volumes and published one for proof-of-concept to line up investment to be able to complete the rest (one very well-known, highly respected global brand has already expressed interest in helping Bondoc, based upon the success of The Hatch). In this first book, the curious, creative Radimus bursts into the world. His mother worries for his safety, but ultimately allows Radimus to follow his heart. 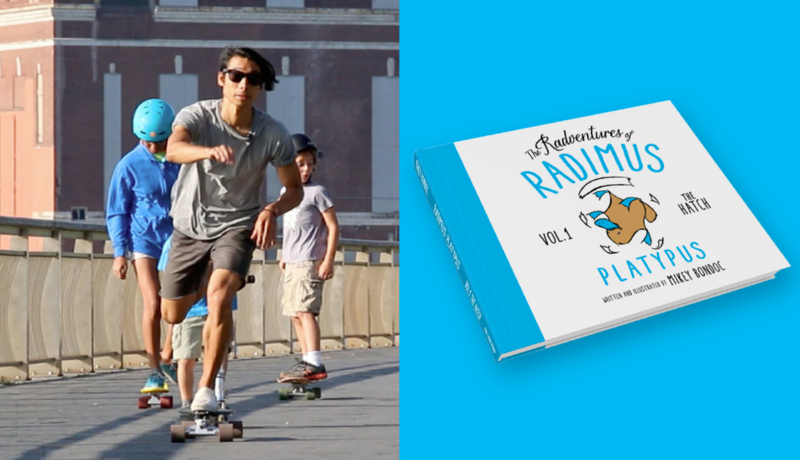 Each subsequent book takes Radimus, who expresses himself through his love for board sports, on another surprising “radventure” where he learns new things, discovers what makes him happy, and grows as an individual. In subsequent books, Radimus surfs, skates, snowboards, wakeboards and even discovers yoga. Parents of all children will enjoy sharing “The Hatch” and its encouraging messages with their little ones. And parents who happen to be into surfing, skating and snowboarding will quite likely want to set this brilliantly illustrated rhyming tale right up alongside classics like, The Cat in the Hat and Oh, The Places You’ll Go. To be certain, Radimus channels the positive spirit of Dr. Seuss and other lovable, iconic characters of youth like Kermit the Frog. At the same time, Radimus’s unique, modern context allows the playful platypus to connect with today’s generation in ways that are more relevant and thus, likely more meaningful to them. Bondoc’s own story of self-discovery is a radventure unto itself. An accomplished graphic designer, art director and apparel consultant with more than 20 years of experience working for big-named brands, Bondoc moved from New York City to Orange County in 2008, craving more time outdoors and in the ocean than he was getting where he was at. Once there, he rented a 100-year old oceanfront cottage in Laguna Beach and began practicing yoga to invigorate his creativity while freelancing. In 2009, a friend -an intuitive medium- told Bondoc that when she looked at him, she saw the Sesame Street character, Big Bird, and felt he had the potential to work with children. Exactly one week after that event, the name Radimus Platypus came to Bondoc, along with the entire storyline for “The Hatch”. With stories in hand, Mikey reached out to about two dozen publishers and a handful of agents, but received little response. One agent indicated that he liked Bondoc’s character and stories, but felt he was the wrong person to represent Mikey. In 2011, undaunted and realizing he had to take the next step, Bondoc commissioned an illustrator to work on the books. But after a year of trying, he terminated the contract because the feeling just wasn’t right. Too heavy. Too much color… It just wasn’t what Mikey was envisioning. He put the project on the back burner for two years, occasionally researching illustrators, but with little money to commission another one. In 2013, with work ebbing in Orange County, Bondoc decided to return to the creative energy of New York City. A few months later, he would experience another transformative moment on his path to personal growth and the development of his book series. In 2014, with only some sketches of Radimus in hand, Bondoc launched a Kickstarter campaign to help finance production of his books. His campaign was selected as a “Staff Pick”, but Bondoc says he set his goal too high, intent on using one of the best eco-printers around. The campaign reached 18% of its goal, before stalling. In 2015, Bondoc completed illustrating The Hatch. He made his first printed copy and held a few readings around NYC, where he found kids were both stoked on Radimus and enjoyed engaging with Mikey. Bondoc launched a second Kickstarter campaign and was again selected as a “Staff Pick”, but pulled the plug after two weeks, due to a lack of traffic. Determined not to give up, Bondoc decided to front the costs of a small run of books and sell them himself on his website. In early 2016, he signed with Bookmasters in Ohio to print a limited quantity of high quality hardcover copies and opened sales on his website. Since then, Radimus has been steadily gaining traction. The character’s made-for-Instagram IG channel boasts over 1,700 young fans and followers, who, along with their parents, are posting fantastic pictures of themselves doing things they love to do– the things that make them unique… and rad! Radimus encourages kids to tag their posts with the hashtag, #imradtoo. With the groundswell of interest in Radimus rising and the likelihood of finding investment also stacking, both Bondoc and Radimus may soon find themselves living out the very lessons they’re both so committed to imparting: Be yourself. Follow your dreams. And don’t be afraid to go for it. Because all of us are rad in one way or another. And if we’re just brave enough to live that out, we might surprise ourselves with what we can accomplish. Note: This article was originally written for and published on The Inertia. To see the original article and response, click here.